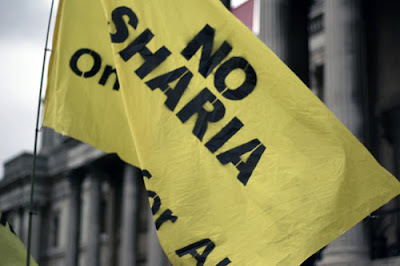 Hundreds protested in London against Sharia Law this week. The protesters joined the anti-racist rally to oppose religious-based Islamic law in Great Britain. 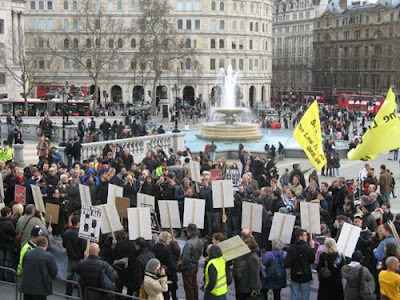 London — Nearly 600 people joined the One Law for All anti-racist rally against Sharia and religious-based laws in Britain and elsewhere and in defence of citizenship and universal rights in Trafalgar Square and marched towards Red Lion Square in London. Hundreds then joined our public meeting to discuss and debate Sharia, Sexual Apartheid and Women’s Rights. Our protest was met with widespread support and left many feeling inspired and invigorated. It was also covered by the mainstream media, including BBC Radio 4, BBC 5Live, BBC Wales, and the Times. After listening to a number of speeches, including from Sargul Ahmad, Jalil Jalili, Shiva Mahbobi, Reza Moradi, Maryam Namazie, Saeed Parto, Sohaila Sharifi and Bahram Soroush the crowd then marched through Strand and Kings Way to Red Lion Square with demands to end Sharia law in the UK and elsewhere. At Conway Hall, they heard live music from the group, Raised Voices, then joined a public meeting and heard a panel of distinguished speakers discuss Sharia Law, Sexual Apartheid and Women’s Rights. The meeting was chaired by Sohaila Sharifi (Central Council of Equal Rights Now – Organisation against Women’s Discrimination in Iran). Speakers included Yasmin Alibhai-Brown (Journalist and British Muslims for Secular Democracy Chair), Naser Khader (Democratic Muslims Founder), Kenan Malik (Writer and Broadcaster); Yasaman Molazadeh (One Law for All Legal Coordinator); Maryam Namazie (Equal Rights Now – Organisation against Women’s Discrimination in Iran, One Law for All and Council of Ex-Muslims of Britain Spokesperson), Pragna Patel (Southall Black Sisters and Women Against Fundamentalism founding member), Fariborz Pooya (Iranian Secular Society and Council of Ex-Muslims of Britain Chair), and Carla Revere (Lawyers’ Secular Society Chair). Sargul Ahmad (International Campaign against Civil Law in Kurdistan Iraq head) also spoke about the situation in Iraq under Sharia and the need for international solidarity. After their march to Conway Hall, the protesters heard live music from the group, Raised Voices, then heard a panel of distinguished speakers discuss Sharia Law, Sexual Apartheid and Women’s Rights.